My blog post output has been slowed down recently as a result of nothing more sinister than the very busy start of a new school term and the rescue and adoption of a beautiful new kitten to add to the AFB animal menagerie, so, there's a bit of a backlog of toys and statues waiting for a look-in. I generally to look at things in the order of purchase, but I picked up the DC Direct Alex Ross Justice Society of America Wave Two figures last week, and I felt they needed some urgent attention. I could take or leave many of the newer members of the JSA, and as it looks like DC Direct hasn't committed to this series beyond Wave Two, I'm glad we've not had to suffer too many of them. 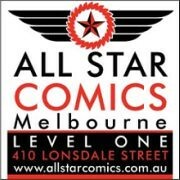 Stargirl and Cyclone are the youngest members of the team, but also some of the more interesting, so they both definitely warrant a figure. 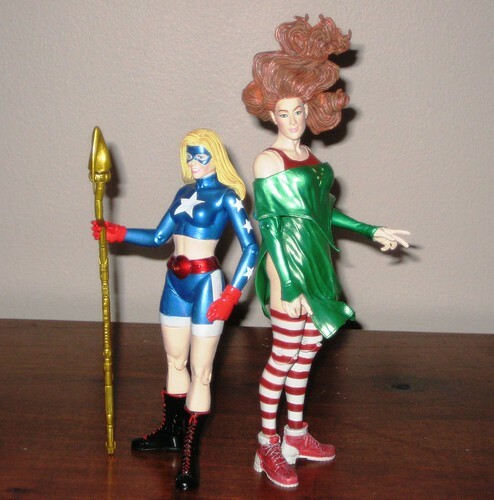 Stargirl is already a seasoned veteran in many ways, and Cyclone, as well as being a legacy character that goes straight back to the early JSA, has such groovy powers, especially the way she can grow SO tall.... what? Yeah, no. While I wouldn't put it past Alex Ross to retcon or reshape any character, this has to be a boo-boo of the kind that only DC Direct seems to manage. Yes, Cyclone is Giant Girl in Raggedy Ann stockings, and it's not due to her wispy hairstyle. She's just plain huge. In fact, she's taller than Superman and Hourman, without factoring in the hair. It's a shame, because this is an utterly beautiful figure. I'm going to get around this in my display by putting Cyclone on a flight stand (and putting another figure in front of her to hide the lack of articulated ankles). Stargirl is a really lovely piece. I'm not totally wild about her face - it looks a little bit old, but then this is a Ross-styled line. Her outfit is very well done,a and in fact paint on all of the figures is excellent. The biggest niggle with Stargirl is articulation. The DCD standard issue fixed ankles means lots of fiddling with other joints to make sure she's stable. You'd think that Giant Cyclone Girl would be the most disconcerting thing in this wave, but wait until you see Hourman's nose, which shouldn't be hard. Just try Google Earth for Canberra, Australia. My lawn needs mowing, but I doubt you'll even see it. Good Lord, that's a big schnozz! It looks like the sculptor forgot to include a nose, so they had to be applied later. Shame, because the body is a great improvement over the Total-Justice style Hourman body from the previous JSA series. Awful, awful, awful. Kingdom Come Superman is here too. He and Hourman are the clear pegwarmers of the wave, most likely because they've both either been done or re-released recently. Oh, and because Hourman is horrible. 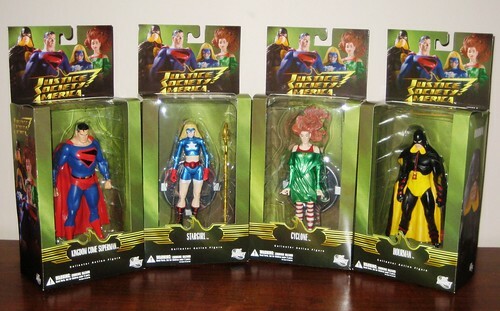 While I'd rather have a non-artist specific JSA from DC Direct, I accepted the Alex Ross series because it seemed the only way to get figures of these great characters. Wave One was passable, but the Cyclone and Hourman hiccups here are potential line-killers. 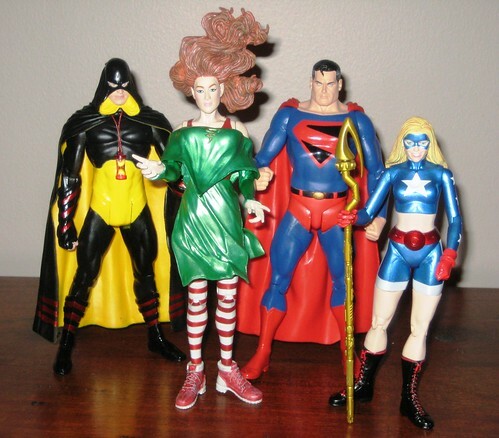 There's several great characters in the JSA world that really deserve their time in plastic, so here's hoping DCD gets it's act together or, more likely, Mattel shows the Modern Age JSA some more love in DC Universe Classics. You can see more pics at Facebook, discuss this at the AFB Forum, and comment on this post to enter the May AFB Comment of the Month Contest. Hourman doesn't look *that* bad. Giant Cyclone is pretty crazy however. 'Cyclanta' is a bit of a worry. You have to wonder who QC approves this stuff? I might pick up a Supes as I like the Ross version. With no nose, how would Hourman smell? /\-- lol, DC Direct makes some really great looking figures but it is kind of too bad about the articulation.